Scuttle: A Little Bit of Fashion & Alot of Sparkle: Bombs Away! I am convinced that you always have one current obsession. You know, that one thing that your eye keeps jumping to when you skim a magazine advertisement or that one piece that you gravitate to in every store you walk in. Right now my current obsession is bomber jackets. My issue is that I refuse to get a regular, solid or two-toned one like most people, I am being difficult & gravitating to all the ones with a pattern! Patterns can be tricky though because I want something that is fun but still classic. 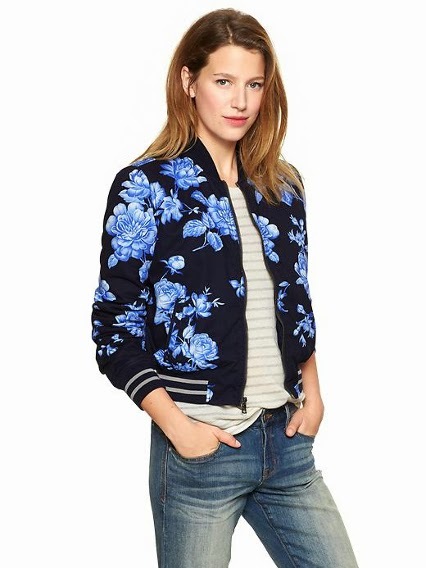 I'm currently in love with this floral one from gap. There are so many great options out there! What is your current obsession?